The peach season seems to be lingering a little bit later this summer, because there are still bushels and bushels of fresh peaches in the markets and stores right now. 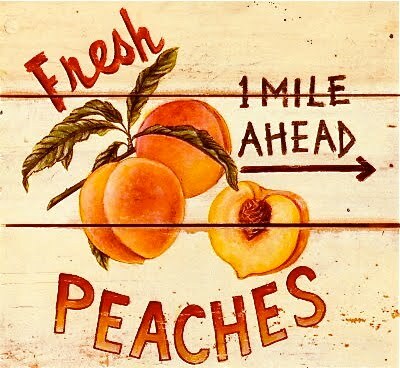 We always buy our peaches from our favorite, special fruit stand on the SC/NC border (on the SC side where the foothills of the Blue Ridge Mountains are and where peach trees thrive). 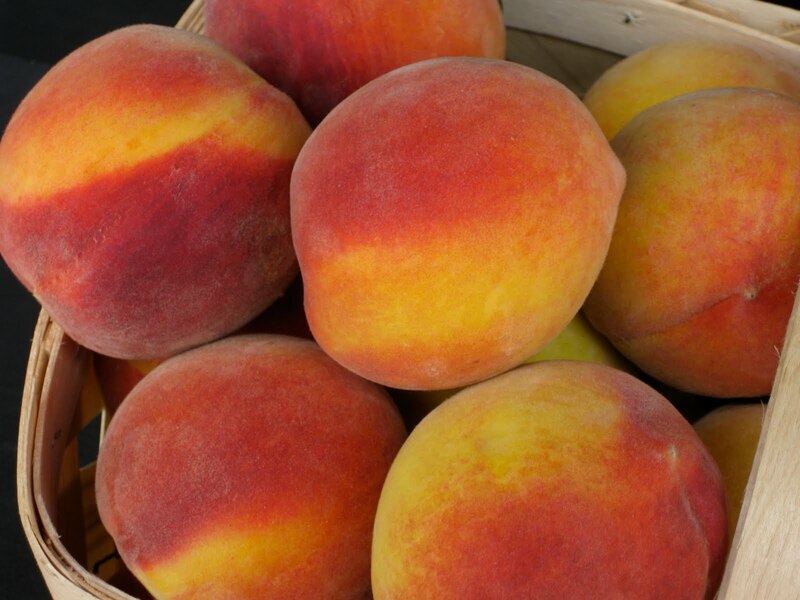 If you have ever driven (south) across the northern border of SC on Interstate 26 or Highway 25, you immediately begin to see the “peaches for sale” signs and then just as quickly as they appeared, the signs vanish about 45 miles south of the border. So we decided to make some peach ice cream (again!). . . and I say ‘again’ because the first recipe that I found this past July was from the Neely’s show on Food TV Network (the recipe was and still is posted on the web-site). Well, let’s just say that it was so sweet that we threw the entire batch away! We rarely throw food away, and in fact, we are huge left-over fans. But I tell you that not even my sweet-toothed husband could eat more than a half teaspoon of that stuff. So down the drain it went, along with four cups of our precious fresh peaches. I was not too happy at that moment seeing the waste . . . but at least living on an acreage with a (uh-hum) septic tank, I know that it is working its way back into the earth. So my search for the perfect peach ice cream recipe carried on! Ultimately, I found a wonderful recipe from The Perfect Scoop by David Lebovitz (former pastry chef of Chez Pannise) which sounded divine! It’s so simple to make that hubby made it with the help of our ice cream machine while I taught an evening class last night. As always, a few changes were made that are noted below. That creamy peach ice cream was just waiting to say “hello” to me when I walked into the house (along with hubby)! 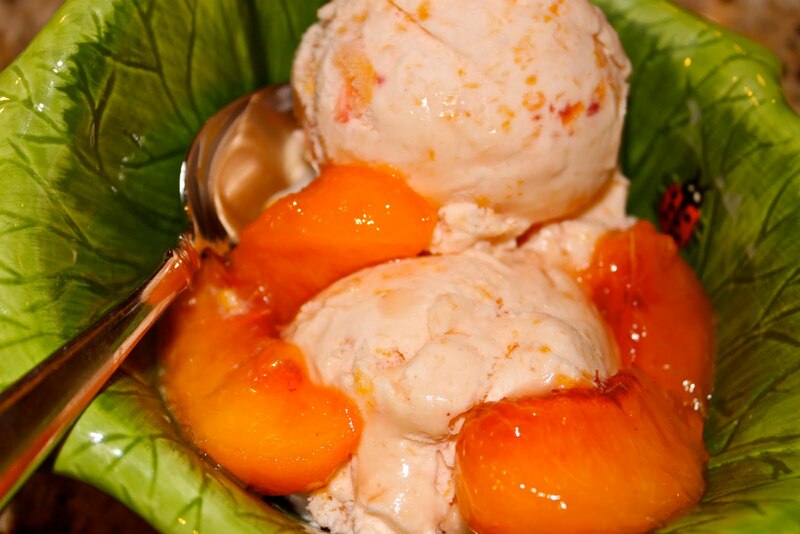 This peach ice cream recipe is simply perfect, luscious, and intensely peachy! You can clearly taste the fresh peaches in this version, plus the two different kinds of cream make it silky and smooth, and there is just the right touch of sugar. Mmmm! I hope that you enjoy this comforting frozen treat of peaches and cream perfection. 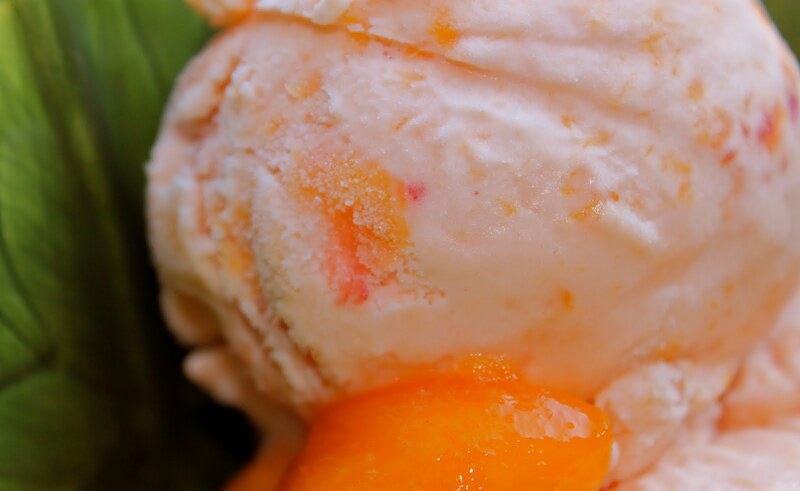 Just look at the chunks of fresh peaches in this ice cream! Place a large bowl or container in the freezer to chill it before you get started. This container is what you’ll put the finished ice cream in and it will already be pre-chilled nicely. Peel and slice the peaches, remove the pits. Cut the peaches into slices or chunks. (original recipe calls for cooking the peaches in 1/2 cup of water for 10 minutes; I skipped this step because I like peaches that are more fresh and uncooked). Add the sugar to the peaches. Blend the peaches and sugar with the sour cream, heavy cream, vanilla extract and the lemon juice with an immersion blender or hand-held electric beater. Pour the mixture into the ice cream maker and follow the manufacturer’s instructions. Freeze for several hours or overnight until desired level of firmness is achieved. I now know just what to do with all our surplus peaches, thanks for the recipe. I only wish there were peaches still hanging out around here. More specifically I wish my neighbor still had some hanging on his tree! Your ice cream looks wonderful. I really liked this recipe because it tasted like PEACHES, as it should. So many peach recipes taste like vanilla with peaches thrown in there. This one is different. So glad your husband made this for you and even more that you loved it! Love the peaches Roz. Our peaches in this area are the best. Your ice cream looks incredible. I love peaches. This post looks so very deliciously beautiful. I love peach ice cream your photo;s are making me want to eat the picture wowowow!!!!! those peaches have my name on them! I love your ice cream! I want some of your homemade peach ice cream sooooo bad! It looks absolutely delicious! yummm…stopping by from friday follow over forty I am your newest follower, stop by sometime..
You lure me in with your scrumptious posts! That looks amazing! Hope you are having a lovely Friday! YUM, about says it all! thanks. That recipe looks amazing! And your blog is beautiful! I’m visiting from Friendly Friday. Have a great weekend! Oooo! peach ice cream..looks great! Good to see you on Green Follow blog hop! My blog, “Inspire!” has inspiring messages about family, faith and the human spirit. You are welcome to stop by! OMG -this looks so yummy! Peach is my very favorite flavor of ice cream. And…I just froze 1/2 bushel of peaches last week and was looking for some new peach recipes. I think this will be my first one to try. Thanks for sharing. That looks so delicious and fresh! My mouth is watering now!